Ten classic great songs that you haven't yet heard. If you loved music by groups like The Band, Chris Isaak, The Eagles, CCR mixed with modern sounds like Matchbox 20 and a more acoustic Green Day you'll love this CD. This is great acoustic melodic pop. For over a decade, Tiller’s Folly has been producing great original music and memorable live performances across many states, provinces and countries. From the dynamic vocals and classic songwriting of Bruce Coughlan, through the virtuoso musical layers added by award-winning multi-instrumentalist, Nolan Murray, to the driving foundation laid down by bassist vocalist, Laurence Knight, Tiller’s Folly is a totally unique music experience whose day is here. Based out of Vancouver, BC, the group shines a fine spotlight on their Pacific Northwest home. Tiller's Folly has released an impressive catalogue of material, covering a broad palette of original acoustic music, including six CDs, videos, and a complete DVD/CD package. Their CDs have topped sales charts and both albums and individual songs have been nominated for and received awards and distinctions. Highlights include: A Ripple in Time picked as the top CD by the Indie Acoustic Project in 2003; 'Water at the Bar' voted the Top 5 Celtic Song of 2006 by Just Plain Folks; 'McCulloch's Wonder' listed as one of the Essential 75 songs of Canadian Folk by iTunes, and the DVD A Fine Kettle of Fish featured numerous times across Canada on the Knowledge Network in 2006. 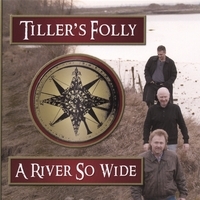 This fall, Tiller's Folly is celebrating their 10th anniversary with the release of their sixth CD, A River So Wide. This CD presents Tiller's Folly at the top of their game musically and creatively. It features 10 incredible new tunes that will appeal to music lovers everywhere. A River So Wide also features illustrious guests, including Grammy award-winning keyboard player Larry Knechtel (Simon and Garfunkel, Elvis, Dixie Chicks), vocalist John Cowan (New Grass Revival, Doobie Brothers, John Cowan Band) and co-producer, mixing wizard Stephen Drake (The Odds, Tragically Hip, Nelly Furtado), joining Bruce, Nolan, and Laurence. Wow! This terrific album touches all the bases - pop, rock, folk and country ... and the vocal harmonies prove that Poco and Eagles references are well-deserved. "The Things I Haven't Done" sounds like a vintage Blue Rodeo tune, and Bruce Coughlan's voice is often similar to the voice of Goo Goo Dolls frontman John Rzeznik. The folk tune "Last of the Royal Engineers" sounds like it was borrowed from a McGinty or Schooner Fare set list. From mid-tempo pop-rock tunes to ballads, this album truly does have something for everyone. I'm going to check their tour dates and plan my next trip to the Pacific Northwest to see them!